There are two ways you can sign up for direct deposit. We highly recommend everyone sign up for direct deposit to get paid faster! You can also sign up directly in your app by going to your sidebar > Account > Payroll > Click "Add Direct Deposit"
You will be able to directly login to your bank account and link your direct deposit. If you cannot find your bank there is a link on the same page where you manually enter your bank information where it says "click here to manually add your account information". Please click "Use new bank account" to change your direct deposit account. Please note that this will only change your account moving forward and we will not be able to reverse any processed payments. How long will it take for my Direct Deposit to be active? If you enroll before the end of the current pay period, you will be paid on direct deposit for that pay period. If you enroll after the pay period ends, you will be paid on direct deposit for the following pay period. 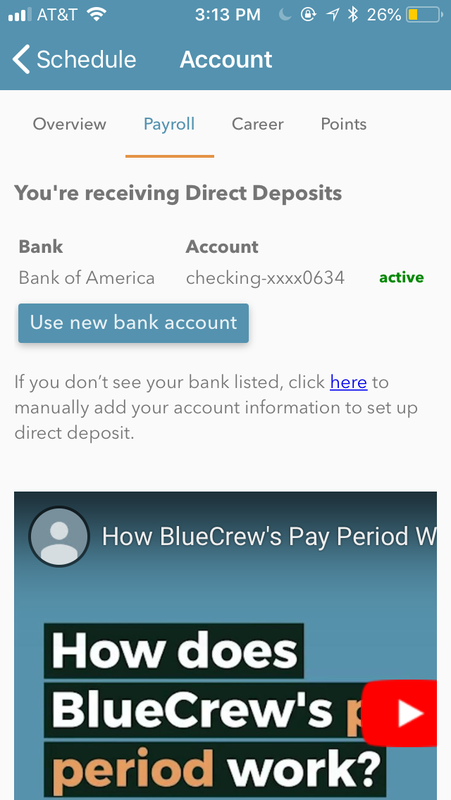 If the direct deposit account we have on file for you has returned in our system as invalid, you will need to re-sign for direct deposit with a valid account using this link https://www.bluecrewjobs.com/directdeposit in order to receive direct deposits. If you don't have another account, you will default to paper checks. Your account number does not correspond with your personal information identified when entering your information. You will need to use an account that is in your name. How do I go back to checks / remove my direct deposit? Please reach out to us directly on Contact Support to request to remove your direct deposit account completely and to go back to checks.